Avila Beach Party - Otter Productions Inc. | Otter Productions Inc. Avila Beach Party - Otter Productions Inc. The AVILA BEACH PARTY returns to the Central Coast on Friday night, May 23rd at 5PM. This is your Summer Beach Party! 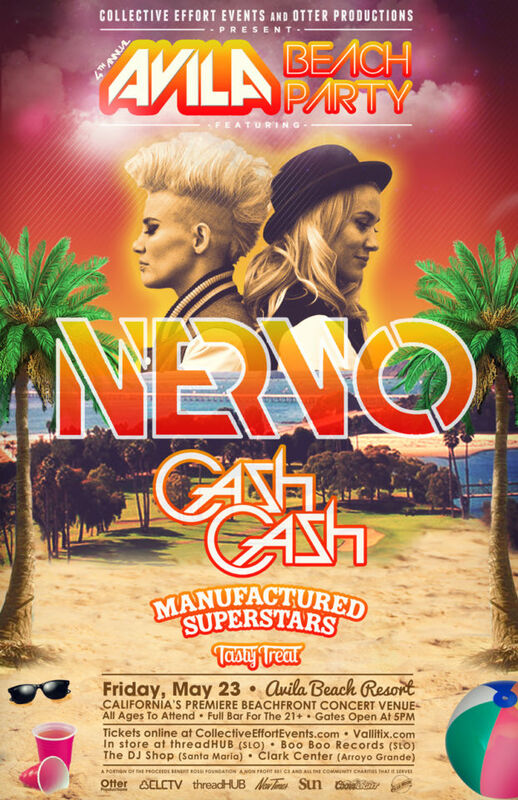 Past year’s artists have included LMFAO, MGMT, Dev and the Cataracs, Shwayze, and Above & Beyond… This year’s event features the top ranking female DJs in the world, NERVO plus very special guests CASH CASH, Manufactured Superstars and Tasty Treat. These multi talented DJ dynamos are the all­time top­ranking female DJs in the world, voted by their legions of fans to No. 16 on DJ Magazine’s influential 2013 “Top 100 DJs” poll. In­demand and beloved across the globe, their nonstop schedule takes them from the shimmering beaches of Ibiza, to their studio in their home­away­from­hometown of London, to the towering Main Stage of Electric Daisy Carnival in Las Vegas. And everywhere they go, their infectious energy, fearless personal style, and deep love and understanding for the music precedes them. Mim and Liv’s career caught fire in 2009, when they co­wrote the the emphatic and grand global hit “When Love Takes Over” – for David Guetta and Kelly Rowland. But their journey into dance music started years prior in the festival fields of their native Australia, when as teenagers they went all­out for life­changing electronic acts like The Prodigy, Basement Jaxx, and Fatboy Slim. Fortunately the girls can get a regular fix during their residencies and headlining sets at some of the top venues and events in the world including the new Las Vegas mega­club Hakkasan and Ibiza Beach Club Ushuaia (home to their #NERVONation parties). NERVO are also regular Main Stage performers at festivals like Tomorrowland, Electric Daisy Carnival, Ultra Music Festival, Creamfields, and Electric Zoo as well as embarking on Headlining tours of their own in Mexico and beyond! Wherever it may be the sisters are always playing to their devoted fans who wear homemade NERVO t shirts and hoist signs (“Will you marry me?”; “Lesbians for NERVO”), curve their hands into heart shapes, and post photos and poems to show their love and appreciation. NERVO has seen rapid growth across their social media channels including 182K Instagram followers, 293K Twitter followers and over 1.4 million likes on Facebook. Style, savvy, positivity and talent: It’s no wonder that NERVO was invited to join the ranks of the legendary beauties who can call themselves CoverGirls, named to the iconic CoverGirl brand’s family of spokeswomen last year. The partnership is just one more fabulous chapter in the developing NERVO story, a tale told in sweat, smiles, nail polish, neon, and no small amount of pixie dust. NERVO are regularly featured in Vogue, Elle, Cosmopolitan, NYLON, In Style, People and other fashion/pop culture publications around the globe. In August 2013 NERVO performed live from the red carpet at the MTV Video Music Awards and in November they will appear on BRAVO TV as guest judges on the Rihanna produced reality show ‘Styled To Rock’. 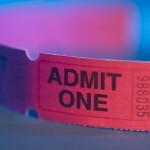 Advance General Admission tickets on sale now at all VALLITIX locations including Boo Boo Records in San Luis Obispo, charge by phone at (888) 825-5484, order on line at: www.vallitix.com. Advance tickets also available at EVENTBRITE.